140 GREEN, Size: 7.25" X 7.25"
With the help of expert’s team and high-tech infrastructure, we offer an extensive collection of Gatefold Laser Cut Wedding Card. Hard case bound envelope is unique features of this invite. Price is inclusive two inserts, envelope & over printing. - Extra inserts inclusive of printings : 40 Rs. - Extra inserts Minimum Order Quantity : 100 /min. 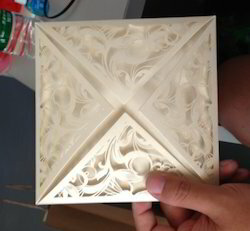 This stunning box with Laser cut design opens on four sides to hold invitations. The middle of the box can hold dry fruits and sweets. This design is available in other colors and it can be customized. We design Customized Designer wedding invitation cards in various materials like fabric, wood, imported paper and laser cut invites.